No time for a book tour but you would still like to get a little bit of book promotion in? Do you have a free book or sale price to promote? 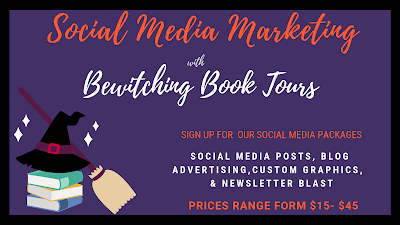 Sign up for one of Bewitching Book Tours social media book promotion packages. You can announce pre-orders, new releases, cover reveals, sales, freebies, or simply put a spotlight on a backlist book. Each package includes a Social Media Script with custom hashtags and a social media graphic.